Year 83 BC was a year of the pre-Julian Roman calendar. At the time it was known as the Year of the Consulship of Asiaticus and Norbanus (or, less frequently, year 671 Ab urbe condita). The denomination 83 BC for this year has been used since the early medieval period, when the Anno Domini calendar era became the prevalent method in Europe for naming years. Spring – Lucius Cornelius Sulla returns to Italy from his campaigns in Greece and lands with his legions unopposed at Brundisium. He defeats the popular forces of Gaius Norbanus in the Battle of Mount Tifata. Gnaeus Pompeius, age 22, raises on his own initiative a private army of three legions from his fathers veterans and clientelae in Picenum. 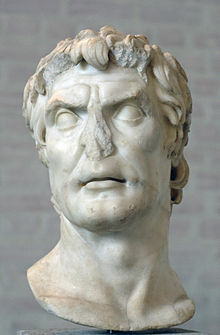 Lucius Licinius Murena, the Roman governor of Asia, clashes with the Pontic forces of Mithridates VI, starting the Second Mithridatic War. A fire breaks out which burns down the Temple of Jupiter (Jupiter Capitolinus) and destroys the collection of Sibylline Books. ^ Nic Fields (2012). Osprey series: Command - Pompey, p. 7. ISBN 978-1-84908-572-4.